Back row, from left to right, Cameron Gillis, Stéphane Garrigan, Rod Swatton, Glen Quinn, Daniel Wakeling, Aidan O’Sullivan. Front row: Martha Stanley, Peter Moule. These students will do research into fat biking. February 7, 2019 – Thunder Bay, Ont. 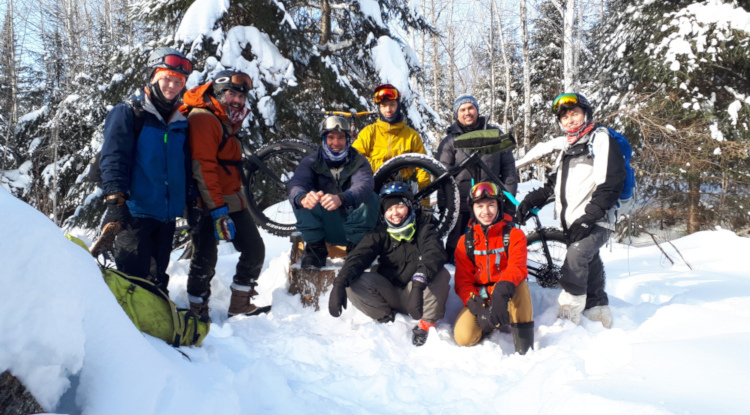 This winter, seven undergraduate students and instructors from the School of Outdoor Recreation, Parks and Tourism at Lakehead University are exploring how people use fat bikes in recreational and sporting activities throughout Northwestern Ontario and Northeastern Minnesota. As one of the first post-secondary courses to be offered on fat biking, Topics in Outdoor Recreation – Fat Bikes: Big Tires – Big Aspirations provides a unique experiential opportunity for students to acquire fat biking skills while also conducting interviews with managers, shop owners and fat bikers throughout Northwestern Ontario and Northeastern Minnesota. Researchers will publish the findings from these interviews in reports and publications, and present them at local and regional workshops and conferences. Anyone interested in learning more about this research project is encouraged to contact Dr. Harvey Lemelin in the School of Outdoor Recreation, Parks and Tourism at harvey.lemelin@lakeheadu.ca, or 807-343-8745. The Thunder Bay Police Service will conduct Immediate Rapid Deployment (IRD) Training on Friday, Feb. 8 in Lakehead's Prettie Residence and on Saturday, Feb. 9 on the fourth floor of the Centennial building. Please contact Frank Sgambelluri with any concerns or questions at 343-8131 or by email at fsgambel@lakeheadu.ca. Dr. Chander Shahi, Dean of the Faculty of Graduate Studies, has indicated his intention to be considered for a new term as Dean. A Decanal Review Committee has been established. 1. The Faculty of Graduate Studies and its future. 2. The leadership of Dr. Shahi. Unattributed feedback will be used to inform the decanal review of Dr. Shahi, as well as the ongoing development of the Faculty of Graduate Studies. Please respond to provost@lakeheadu.ca by Friday, Feb. 15. The Department of English presents the Work-In-Progress Series. English Master's student Samantha Dewaele will speak about her current project Comics, Closure, and Climate Change. Monday, Feb. 11, 1-2 pm in ATAC 5036 and OA3041. Video-conference from Orillia. The Lakehead University SWSP provides full-time employment to eligible undergraduate students during the spring/summer. These positions provide students with a valuable opportunity to work with, and be mentored by, Lakehead University faculty and staff. The subsidy will cover up to $2,250 in wages and payroll deductions and is based on 480 hours and 16 weeks worked (30 hrs/wk for 16 weeks). Employers may complete a Job Request application by logging in as an “Employer” via the MySuccess Portal from February 1-28. Applications submitted after the deadline will be considered as space permits. Further questions may be directed to Cheryl Ellis at cellis@lakeheadu.ca. The Department of History welcomes faculty, students and staff to its monthly presentation series History for Brunch. February is Black History Month and it is fitting that Dr. Ronald Harpelle will be presenting Mutiny in the Aftermath of WWI: The British West Indies Regiment in Taranto on Monday Feb. 11 from 10:00 am to 11:00 am in ATAC 2021 and videoconferenced with Orillia in OA 3007. All are welcome. This is a free, public seminar. No registration is required. Are you interested in studying abroad? Find out more about the opportunities available to you! Lakehead University has partnerships with universities all around the globe, from the sunny beaches of Australia all the way up to the Arctic circle. Students can choose to spend a semester, summer or full-year abroad at one of our international partner institutions while earning credit towards their degree. Where could your education take you? Study Abroad Information Sessions are happening next week on February 12, 13, and 14. Register for a Study Abroad Information Session HERE email studyabroad@lakeheadu.ca for more information. The Faculty of Business Administration and the RBC Work Integrated Learning Program Workshop Series invite you to a workshop called Critical Thinking vs Analytical Thinking: What’s the Difference? In the changing world of work, critical and analytical thinking could be the most important skills in your toolbox . . . But what does that mean and what is the difference between the two? Rhonda is an engaging and entertaining speaker ready to clear up this question for us. Dr. Rhonda Dubec is a long-time instructor of English, Latin, Linguistics, and Etymology and now also works in the Teaching Commons helping other instructors teach in more engaging and effective ways. The session is open to all students, staff and faculty. Please RSVP to Maryann Kleynendorst, Experiential Learning Navigator at mkleynen@lakeheadu.ca. Join Dr. Rhonda Dubec, Coordinator of Instructional Development and other Teaching Commons staff for a conversation about "how to engage students in course content." #4: Friday, March 1, 2:45-3:45 - Creating a culture of academic honesty. #5: Tuesday, March 12, 10:15-11:15 - Managing breadth and depth. #6: Friday, March 29th, 2:45-3:45 - Becoming an even better professor. The RESEARCH & INNOVATION OFFICES invite you to participate in a Research and Innovation Professional Development Workshop – SETTING UP START-UP COMPANIES: Tips for the Entrepreneur. Presentations will be peer-judged by the participants. Winners from each Faculty will be invited to lunch with the President on Friday, March 8. Theme for R & I Week: Rise of the Machines. This panel discussion on Tuesday, Feb. 26 from 2:00 - 4:00 pm in ATAC 5036/OA 3007. It is also available by videoconference via Zoom. The panel features researchers from diverse disciplinary backgrounds who are using social media in different ways in their research, whether in data collection, dissemination, or both. The panel will touch on the benefits and challenges of using social media as a research tool, as well as ethical considerations. The session is geared towards researchers (faculty & student); however, anyone is welcome to attend. Coffee & cookies will be served. For more information and to RSVP visit this website. On behalf of the Lakehead University's Office of Research Services, please join us for Lakehead University's Health and Technology Forum to be held as part of our 14th Annual Research & Innovation Week. The Health and Technology Forum will take place on Monday, February 25, 2019 and will feature a number of exciting events with our keynote speaker and bestselling author, Prof. Timothy Caulfield (Canada Research Chair in Health Law and Policy, University of Alberta). The forum aims to promote discussion and constructive debate around the topic of advancing technology and its impact on health and healthcare in Northwestern Ontario. By observing the intersection of health and technology from multiple perspectives, we can explore its positive and innovative impacts on care and well-being, while also confronting the potentially harmful ways in which modern technology can affect the mental and physical health in our communities. You are invited to a special lunch and panel discussion facilitated by Prof. Timothy Caulfield. The Panel will highlight some of the innovative technological approaches being taken by Lakehead researchers and community partners to address pressing health care needs in rural and remote regions. For further information and to register for this event, please visit this web page. Dr. Pauline Sameshima (Canada Research Chair in Arts Integrated Studies) will be hosting a walking art exhibition tour, which has been curated to share how the arts function as a technology to engage communities in research to better our lives. For more information about the art works on display, and the artists being showcased, please visit this web page. Please join us Monday evening when Prof. Tim Caulfield will be our keynote speaker, discussing the ways in which social media and celebrity culture are impacting our health and lifestyle decisions. Following his presentation, Prof. Caulfield will be available for book signings. For further information and to register for this event please visit this web page. We look forward to celebrating Research & Innovation Week with you. The Senate Nominations Committee is welcoming nominations from full-time faculty members at the Orillia and Thunder Bay campuses to fill upcoming vacancies on the Senate Standing Committees. These vacancies are self nominated. Please click here for more information or to access the interest to serve form. The deadline for nomination submissions is Thursday, Feb. 28. Please direct any inquiries to Yvonne Roussel at lusenate@lakeheadu.ca. Nominations are being accepted for the Award to Staff for Outstanding Performance and/or Contributions. This award recognizes and rewards outstanding performance and contributions to the University by a non-faculty employee. The Award to Staff Policy can be referenced here which outlines eligibility, selection criteria, and nomination guidelines. If you are interested in nominating an eligible employee, please complete this nomination form and recognize your colleague for the exceptional work they do. Nominations are due no later than Monday, March 1 to the Office of Human Resources. The Lakehead University Native Student Association (LUNSA) is excited to be hosting their 31st Annual Powwow at the C.J. Sanders Field house, March 8-10, 2019. The theme of this year’s powwow is Celebrating Community, and all students, staff, faculty and the greater off-campus community are invited to attend this free event featuring Battle Nation, as the host drum. This community event will gather people together in celebration of Aboriginal culture and dance. Warm-ups will be held on Friday, March 8th from 6:00 p.m. to 10:00 p.m. Grand Entry is scheduled for 12:00 p.m. and 6:30 p.m. on Saturday, March 9th with a Traditional Feast being served at 5:00 p.m. and the powwow will wrap up at 10:00 p.m. for the day. Grand Entry is set for 12:00 p.m. on Sunday, March 10th with the powwow ending at 5:00 p.m.
LUNSA is a volunteer LUSU club. Its goals are to promote the spirit of unity among Aboriginal students at Lakehead University through social, cultural, and recreational events in addition to promoting cultural awareness between club members and the greater Lakehead University student population. The annual powwow is LUNSA’s signature event that showcases tremendous talent and entertainment, while reinforcing traditional aspects of Aboriginal culture such as drumming, dancing, singing, and giving thanks. Attendees can purchase traditional Aboriginal merchandise from on-site vendors.